Situated in the balmy resort of Alcudia in Majorca, this fun-loving hotel makes for a fine choice if you want a summer holiday that’ll satisfy both toddlers and teens. With no less than 8 swimming pools on site and a nearby stretch of beach to lounge on, you’ll be laughing once you book a last minute deal to this popular Balearic resort. When you’re not making use of the aqua park’s whacky waterslides – including everything from colourful kamikazes and multi-lane race slides to relaxing wave pools – check out the hotel’s leisure lake featuring a variety of watersports activities, plus you’ve got a children’s village, kids’ club, mini golf, football, tennis courts and more. With year-round sunshine guaranteed, Gran Canaria is a top pick for family holidays. The 4-star Hotel Paradise Lago Taurito boasts a hilltop location just 50 yards from the sandy beach, and it has a whole host of water and sports activities that are perfect for active holidaymakers – mini-clubs, wellness centres and golf courses aside! Lago Taurito Water Park (the only saltwater park in the resort) is free to enter when you stay at the hotel, and is open Mon – Sun 10am – 6pm. In addition, the hotel offers up a large main pool plus a couple of children’s splash pools to dive into. The hotel is just 10-minutes from lively Puerto Rico – ideal for a day trip or an afternoon browsing the shops, restaurants and bars. The Algarve, one of the most-loved summer holiday destinations for families thanks to its all-round resorts, breathtaking Blue Flag beaches and inviting cobbled towns. This fly and flop destination is ideal for a week-long getaway with the kids (hey, or even longer! ), and the Aquashow Park Hotel should be the first place you check out. Sporting rollercoasters, water slides, lazy rivers, entertainment shows and more, the fun never stops at this 4-star hotel located close to the Vilamoura area. The park’s themed attractions are sure to get kids’ adrenalines pumping, with everything from a mini train to captain, to sky-high swings and reptile and bird shows. The hotel also features a swimming pool, Aquafeeling Spa, Aquakids club, a gym and much more – so you’ll never be short of entertainment. Nestled near the beach on Lanzarote’s sunny South Coast is HL Paradise Island, a 4-star property providing bundles of fun for all the family. The hotel’s four fantastic swimming pools are perfect if you want to relax and take a dip, including the chic solarium terrace ideal for sun-worshippers after a little R&R. For those who want to turn the action up a notch, guests have complete access to popular Dino Park, a spectacular water park equipped with slides, chutes and flumes for both adults and children to enjoy. If you prefer to chuck your towel down on the sand, Playa Blanca Beach is approximately 0.6 miles from the hotel, or why not take a 20-minute drive to famous Timanfaya National Park? Crystal Waterworld Resort & Spa is the region’s biggest hotel, located on the golden beach of Belek Bogazkent, on the Turkish Riviera. Another short haul option for last minute summer holidays, this amazing aqua park hotel is sure to impress the big kids as much as the small. 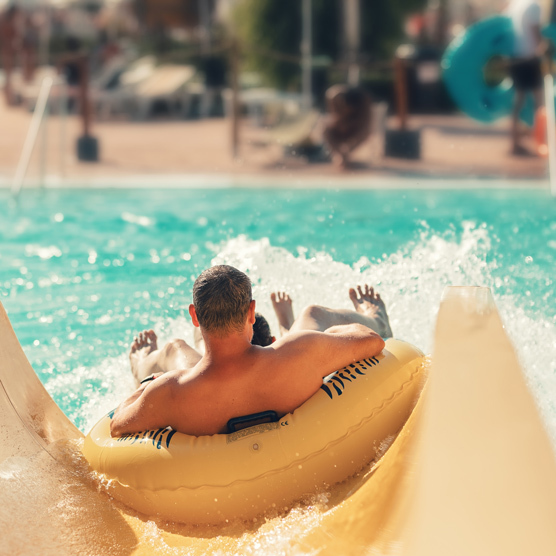 Boasting two towers with seven exciting water slides, a children’s splash area, indoor and outdoor swimming pools, a mini-club, sports and fitness activities, plus a relaxing spa centre to rejuvenate after a day of thrills and spills – there’s plenty to keep guests occupied at Crystal Waterworld. Another Spanish gem close to the popular Levante Beach, Magic Aqua Rock Gardens is Benidorm’s modern theme hotel – or in other words – a paradise for children after round-the-clock fun in the sun. The in-house African-inspired water park wows with its tribal art, waster slides, fountains, and a splash park for the little ones. In addition, the hotel offers services including an outdoor pool, adults-only terrace space complete with Balinese beds and a whirlpool bath (ideal after a long day at the splash park), two buffest-style restaurants, a spa and more. Aqua Rock’s close proximity to the lively town also means there’s entertainment beyond the resort – with local restaurants, bars and shops just 500m away.